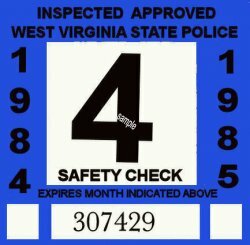 1984-85 WV Safety Check Inspection sticker - $20.00 : Bob Hoyts Classic Inspection Stickers, Add a Final Touch to your Restoration! This 1984-85 West Virginia Safety Check INSPECTION sticker, 2 1/2 x 2 1/2 inches was created from an old image. Different from the original, It was issued by car dealers to show the car would pass an official inspection. For an additional $5.00 we can change the expiration month to your favorite month.